Learn to greater trust in God with these 22 studies that are made for either individual or group study. We all go through times of trouble and suffering. Sometimes we look at our lives or our world and wonder what good could possibly come out of it. That's exactly what we find in the book of Isaiah. Here you'll see how the prophet raises a cry for revival in the midst of a rotting society and you'll find comfort for your own troubled times. 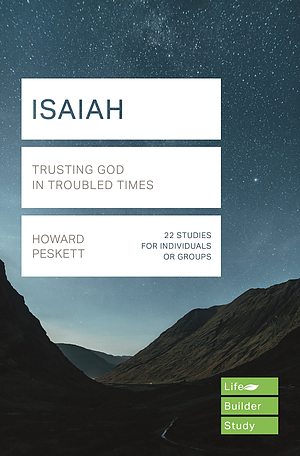 LifeBuilder: Isaiah by Howard Peskett was published by IVP UK in September 2018 and is our 2041st best seller. The ISBN for LifeBuilder: Isaiah is 9781783598243. Be the first to review LifeBuilder: Isaiah! Got a question? No problem! Just click here to ask us about LifeBuilder: Isaiah. Isaiah - Trusting God in troubled times and Lifebuilder - Isaiah. Are these different versions of the same study book by the same author?